This entry was posted in Weekly Photographic Challenge, Wildlife and tagged Kinghorn, Kirkcaldy, marine wildlife, nature, nature photography, photography, Scotland, Weekly Photographic Challenge, wpc. Bookmark the permalink. Thanks Sylvia 🙂 I know that quite a few people, especially women, don’t like jellyfish, and I can understand why. I’ve been amazed at how many we get up here, compared to the warmer waters of Cornwall, some 450 miles south of Fife. My mom lived in Hong Kong for a few years when she was a child, and told me about how the jellyfish there really stung her. We do very occasionally get the Portugese Man o’ War off Fife’s coastline, which will give a very painful sting (and has been known to be fatal to humans), but thankfully these really are quite rare up here! Thanks Alan, I bet you get some excellent jellyfish and various other sea creatures around your shores! The moons look like the ones we had turning up at Exmouth last summer, they are such weird creatures! I wouldn’t want to encounter the other ones though. I love jellyfish. I draw them a lot. I’ve never seen a lion’s mane jellyfish in Fife. That’s a cool find. 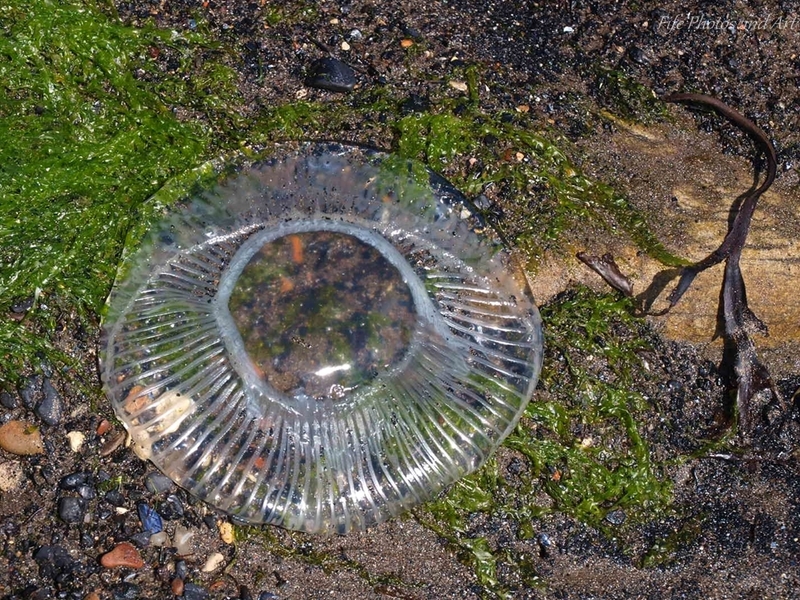 I had noticed your love of jellyfish Laura 🙂 The Lion’s Mane Jellyfish seems to be getting a more and more common visitor to Fife’s coast, I don’t know if this is connected at all to climate change. It most probably is. Since global warming impacts on the Atlantic Conveyer, it must surely have an impact on other currents too. In Cornwall, there has been a very noticeable affect of global warming with regards to one of the bird species. When I was a kid, the Little Egret was a bird worth cycling 30-40 miles to go and see, but by the turn of the millennium, they are found now in every estuary location in the West Country!! And of course, their food chain will be very directly linked to the oceans currents! Such amazing specimens. Hadn’t heard of either of these before. Jellyfish are intriguing. Thank you Ruth 🙂 And yes, I agree with you jellyfish are amazing creatures, it’s such a shame we get so many washed up on our shores at certain times of the years – it’s the unfortunate thing about them being basically free floaters (planktonic), or at best very weak swimmers. Jellyfish are so beautiful, but I know next to nothing about the different species. This is one I don’t think I’ve seen before – a nice find, and probably quite hard to photograph. I can only imagine the giant one sighted off the west coast! I didn’t know that – I don’t remember seeing jellyfish anywhere where I’ve actually been swimming. I’ve seen shoals of them from the boat around Iona and Mull, though. It’s always good to know if they’re harmful or not! Interesting jellyfish! So different to the ones here! And of course, the tropical waters here and further north have many, many deadly species. We have the box jellyfish around here, and the Blue bottle. As a whole species or genus, they are incredible, not least because they are the only creature that is actually increasing in numbers, adapting as the seas become more and more polluted! Even new species are being discovered! So it is in some way related to climate change, but more directly, excess of anaerobic conditions in the sea water from nutrient charged effluent! Thanks for posting these. I am quite fascinated with the Lion’s Mane jellyfish. And no tentacles, it seems…. That’s really interesting Amanda about the jellyfish being able to adapt well to changing conditions, and in some cases thriving with the sea pollution from nutrient charged effluent – I would have guessed that they would be very venerable to changes, they just look so delicate! I imagine you get some amazing jellyfish around your waters. 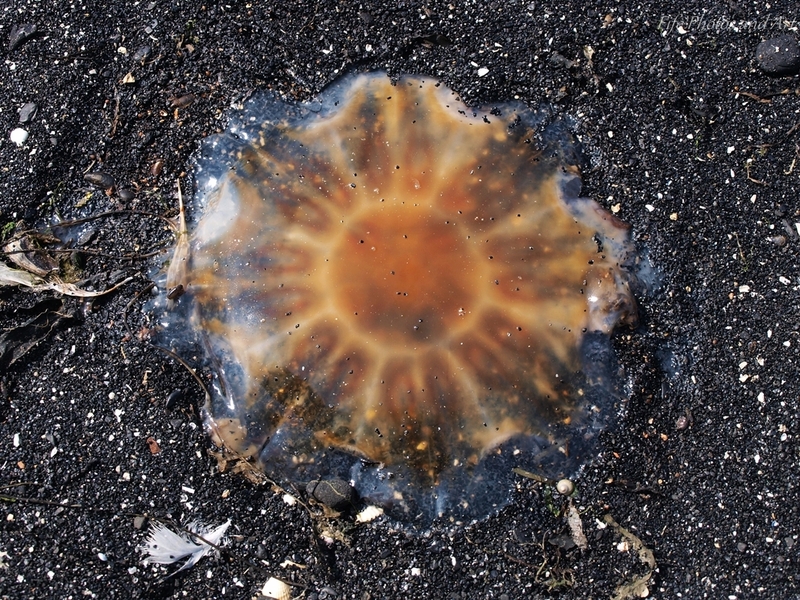 With regards to the Lion’s Mane jellyfish, they definitely have tentacles, but with Moon Jellyfish, the tentacles are very short, so once they are stranded on a beach, they are very hard to see. Ah! That makes sense! They are strange creatures! Some scientists think that at some stage in the future, that Jellyfish willl be the only sea creature as the sea water will have such little oxygen that only creatures that ‘breath’ anaerobically can survive! A sad thought indeed. The oceans are so vast and we use them as a waste tip, covertly or overtly! Perhaps that is a good topic for a post, to create some awareness of the problem and hopefully some change? I was thinking yesterday, (a frightening idea in itself!! Lol!) that I should have realised that jellyfish can adapt to different environments, they are what is known as living fossils, the oldest known jellyfish come from rocks that are over 500 million years old – the more specialised an animal becomes, the less likely that it will survive a drastic change in conditions, as I’m sure you already know Amanda. That’s why I’ve stated for a long time that mankind is destined to be one of the shorter surviving species, despite all our advances in technology! On a geological timescale that is a very short amount of time though! Lol!! I am not planning on being here in a world without prawns, crab, mussels nor fish! I can’t eat jellyfish!! The blue green algae isn’t great company either! Lol!! Perhaps humans woll evolve a digestive system that could cope with this kind of product? Yes, thank goodness it is a good few years away yet. Wow gorgeous! the large one with the 120 ft. tentacles that is huge! yes it would but sounds scary wow! How interesting! I’d never heard of or seen “Lion’s Mane” jellyfish. I remember once a favourite beach in Harris was awash with the kind of jellyfish that have four purple circles in them. These were known to our family friends as “Co-op jellyfish” because of the old logo of the Co-op! These are fascinating creatures and beautiful macro shots of God’s art itself. I wonder if global warming has caused more to wash up on the shores recently? has suggested, it could be due to us as humans polluting the sea which is increasing jellyfish numbers, and hence more get washed up. Wow! The ones you saw on Arran were about 3-4 times the size of these!!! It was either Arran or Fort William, probably about 30 years ago now, the smaller ones were about the size of dustbin lids.. Sadly i was not into photography back then. It is a shame, I know I’ve seen quite a few things in the past where I really wish now that I had, had a camera at the time!! Yup, right place, right time, no camera..